The multitude show their faith by running to Jesus even as He is departing, for which they receive healing as the reward of faith. Their following on foot and without any provisions are also signs of faith. 15-16. And when it was evening, His disciples came to Him, saying, "This is a desert place, and the hour is now late; send the multitude away, that they may go into the villages, and buy food for themselves." But Jesus said unto them, "They need not depart; give ye them to eat." The disciples are compassionate and concerned about the multitude, not wanting them to go without food. What, then, does the Saviour do? "Give ye them to eat," He says, not in ignorance of the extreme poverty of the apostles — far from it. But so that when they had said, "We do not have," He might appear to proceed to work a miracle out of necessity and not from vainglory. 17-19. And they say unto Him, "We have here but five loaves, and two fishes." He said, "Bring them hither to Me." And He commanded the multitude to recline on the grass, and took the five loaves, and the two fishes, and looking up to heaven, He blessed. "Bring the loaves here to Me. Though it be evening, I Who created the hours am here. Though it be a deserted place, it is I Who giveth food to all flesh." We learn from this that we must spend in hospitality even the little that we have, just as the apostles gave to the crowds the little that they had. As that little was multiplied, so too will your little be multiplied. He bids the multitude to recline on the grass, teaching frugality, so that you also, O reader, may not take your ease on expensive beds and couches. He looks up to heaven and blesses the loaves, as if both to confirm that He is not opposed to God but that He came from the Father and from heaven, and also to teach us to give thanks when we begin a meal and only then to eat. 19-21. And He brake, and gave the loaves to His disciples, and the disciples gave them to the multitude. And they did all eat, and were filled: and they took up of the fragments that remained twelve baskets full. And they that had eaten were about five thousand men, beside women and children. He gives the loaves to the disciples so that they might always retain the miracle in their memory and not have it fade from their minds, although they did in fact immediately forget. There was food left over lest you think that He performed the miracle only in appearance. There were twelve baskets so that Judas too might carry one and thus remembering the miracle not rush headlong into betrayal. And He multiplies both the loaves and the fish to show that He is the Creator of earth and sea, and the Giver of what we eat everyday, and it is multiplied by Him. He performed the miracle in a deserted place lest anyone think that He bought the loaves from a neighboring town and distributed them to the multitude, for it was deserted. This is the explanation of the literal account. But in its spiritual sense, learn that when Herod, who represents the fleshly and superficial mind of the Jews (for "Herod" means "fleshly" and "skin-like"), cut off the head of John who was the head and chief of the prophets, it showed that Herod rejected those who prophesied of Christ. Whereupon Jesus withdrew to a desert place, to the nations who were desolate without God, and He healed the sick in soul and then He fed them. If He had not forgiven our sins and healed our sicknesses by baptism He could not have nourished us by giving us the immaculate Mysteries, for no one partakes of Holy Communion who has not first been baptized. The five thousand are those who are sick in their five senses and who are healed by the five loaves. Since the five senses were diseased, there are as many poultices as there are wounds. The two fish are the words of the fishermen. The one fish is the Gospel and the other the Epistles. Some have understood the five loaves to signify the Pentateuch of Moses: Genesis, Exodus, Leviticus, Numbers, and Deuteronomy. 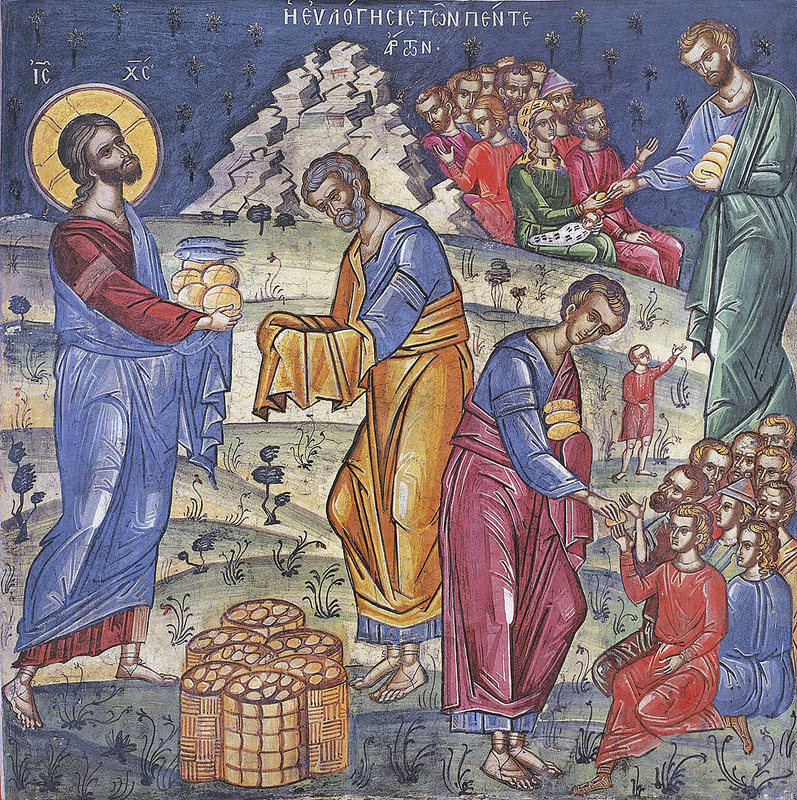 Twelve baskets were lifted up and carried by the apostles; for whatever we, the multitude, are unable to eat, that is, to understand, the apostles carried and held, that is, they accepted and understood. "Besides women and children." This means, allegorically, that a Christian man, woman, or child, must not in any way be childish, womanly, or unmanly. By using the word "constrained", Matthew suggests how inseparable the disciples were from Jesus, for they wanted to be with Him at all times. He sends the multitudes away, not wishing to draw them after Him lest He appear to vaunt in His powers.